Suparimpei "hankie drop of doom" bunkai ... ?? I'd be interested to hear you thoughts on the "whole movement", but hopefully in particular you can address the dramatic opening of the fingers. 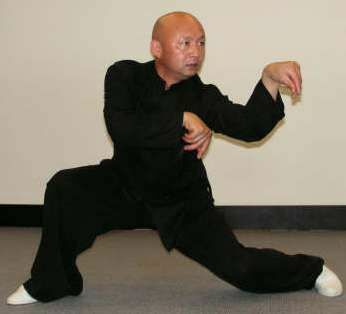 I don't know about bunkai, but the hand position looks a lot like mantis fist in kung fu. That might be a place to start looking. I'd be interested to hear you thoughts on the "whole movement"
hopefully in particular you can address the dramatic opening of the fingers. Only the Shitoryu version has this variation (opening of the fingers). Nice Interpretation, Noah. I liked what you both did. Although I must admit that Jonathan's interpretation was a bit more solid in my opinion this time :) Great job! The application he showed is actually almost EXACTLY the way I apply the sequence I gave him for the challenge, which I thought was really cool! As for the sequence he gave me, it was pretty tough--I tried to incorporate the turn before it, though, which made it harder than if I had just looked at the end posture, itself, so it's my own fault :P. Still the applications I gave are techniques I have used in kakedameshi before, so I know they are workable, even if they may be a bit more finnicky. 1) We have got the grip shown in the photo. Due to the disrupted posture, and the motion of combat, the enemy starts to stubble and fall, we help that happen by releasing the hooked hands and pushing down. 2) Having secured the above grip and gained a dominant potion, we now need to exploit that advantage. We disentangle (open hands), feed both hands under the chin and pull the enemy backward (the following motion where we return to the start). 3) Away from the above grip, the hands motion can also be used to free a wrist grip. You snake the fingers of your gripped hand around the wrist of the enemy (“chicken beak”) and then push down to escape grip (splayed fingers). The non-seized hand can be warping the other arm or hooking the neck; or we could be a double wrist grip. Personally, I think I favour Option 1 as the intent with Option 2 as a back up if the enemy does not fall forward but instead starts to stand back up. Thanks to all who have responded ... you have given me a lot to thing about and digest! The opening of the fingers can only be the release of something previously controlled. Both hands do it at the same time, so you have to assume that they are both involved in the grip / control. You would also need to be positioned such that the enemy can’t hold onto you when you release. You have to be releasing either to escape or move on to a better position. It’s also likely that the motion has been stylised and made more “dramatic” is some versions (especially those used in competitions.). While I really value all the contributions, these general thoughts really hit the key/core for me. They are all simple concepts and I think "dang, I should be able to come up with these by myself, now that I see them laid out in front of me .." but of course I needed them spelled out to really sink in.